Way back in July I was arranging events to welcome Halloween Good Night into the world, but it didn't occur to me then that all the great plans I made meant I'd actually have to do things and go places. At 32 weeks pregnant, as a homeschooling mama of five, this doing and going get complicated. But Saturday morning I packed up my supplies and headed to one of the most popular autumn destinations in the area, Robinette's Apple Haus. With trepidation I set up my book and a bowl of Halloween treats, and a stack of postcards and hoped against hope that at least one person would show up and be interested in the book. I already knew at least one person was coming (Thanks Jen and Adam! ), but what I couldn't expect was the incredible reunion - friends I haven't seen in almost thirty years, family, and more friends. I was busy catching up and chatting the whole two hours. I also loved the curious kids who tiptoed over to my table and snuck a candy. I'd always send them off with an extra treat like a postcard or coloring pages. And like the release party, the event sold out. The next event, as special guest at Grand Rapids Children's Museum would prove just as fun but in different ways! This one was far more structured. Every half hour I read Halloween Good Night to whatever crowd had gathered, then chatted with parents, handed out coloring pages and treats, and enjoyed watching my own little ghouls explore the museum. Five readings later I felt like I'd run a marathon! And to think, I have three events yet to go. Will I make it? Let's hope! 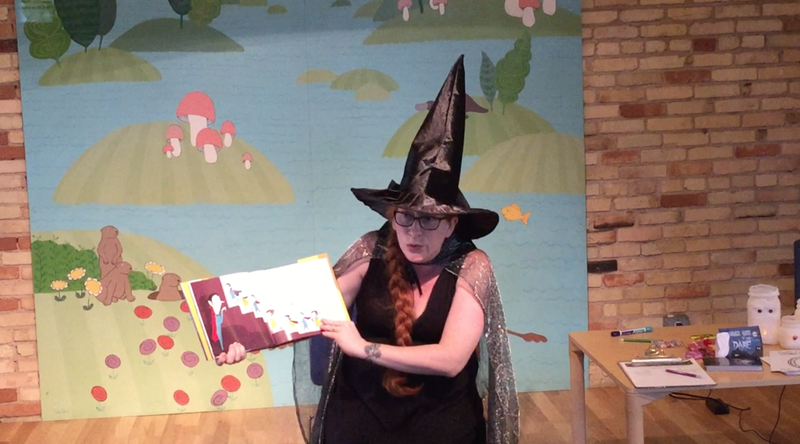 Next up is Schuler Books in Grand Rapids, then Books & Mortar, and a just-before-Halloween party at Hopscotch Children's Store. Though I'm tired (already! ), I can't wait to share more Halloween fun! It's 2018, the end of January when most New Year's Resolutions are fading into oblivion (it's amazing how busy the gym is in January, and by November it's a wasteland). Why not add a little something new? Welcome 2018, Changes To Come! My Very First Fan Art! My first book release included another first: the first piece of fan art I've received! After the reading and food and crafts, one sweet girl came to get her book signed, and to show me the ADORABLE picture she'd colored and decorated (one of the coloring pages available here). She agreed to allow me to share it (her mom, too), so here it is! The release party for my first book happened just over a week ago now, and it was crazy! Crazy busy, crazy fun, crazy full of awesome people. A week (and a bit) later, I'm still glowing. Here's the official full event list. Share it all. With ALL the people. I want to pack out every venue!